Here is a list of your options when ordering a CUSTOM WILLOW WAND. Please choose your colour and preferred Crystals to be set into the wand handle. 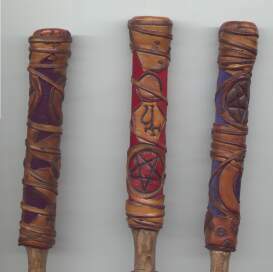 CUSTOM WORK - Design your own Wand Covering or choose the design shown here. Click Here to send an e-mail, quoting code no and your required colour combinations plus preferred Crystals - if applicable. Or, check our ordering page for specific code numbers listed there. Prices do not include postage. Prices are in Australian Dollars. Allow 3-4 weeks delivery for your Wand. Each wand is made by hand - no two are the same. DESIGN CHOICES - we would be happy to quote cost according to your requirements. *Wand Handle - sacred willow wood wand cut upon a waxing moon. *Velvet Colours - red, black, green, purple, azure blue. *Buckskin Colours - brown, black, green, mushroom (light grey). *Crystals - Lapiz Lazuli, Hematite, Carnelian, Amethyst and Garnet. *Themes - Magickal, Egyptian, Gothic, Celtic, Lunar, Solar, Male, Female and many others are available. *Matching Book Of Shadows or Athame - BOS or Athame designed to match your Wand also available. See links to take a look at our selection of Custom Books of Shadows and Athames for examples and ideas. Image - shown in Brown buckskin with Purple, Red or Blue Velvet in Magickal Themes. Click for Detail View - only handle shown here. Hand carved from the finest willow wood, with velvet inlaid buckskin covered handle with CRYSTALS of your choice. Image - shown in Brown with Blue velvet inlay set with LAPIS LAZULI stones. Lapis Wand - only handle shown here. Click Here to send an e-mail to customWands @ whitemagic.com.au, quoting code no and your required colour combinations please. All Custom Wands are individually custom made to your specifications - please allow a minimum of 3-4 weeks for delivery.